Darwin’s humidity is oppressive – like a blanket that follows and swallows you up. Local Aboriginals can stand the heat and are the majority of life one finds on the street. As a small town, Darwin has taken more hits than most. Bombings by the Japanese and the flattening from a hurricane, for a place that seems to mind its own business, this dot of humanity on Australia’s shoulder has had to be resilient. Our ship sailed north and towards East Timor. A new country with high unemployment, the nation struggles to make ends meet. The young population hangs out in the small mall and hustle the few tourists without the intensity of Indonesia. Maybe there is more optimism here but little stands out at first glance. In Komodo National Park I kayak to pink beach and swim the day away. Without protection, I am now a lobster with feverish lips like a botched Botox job. But it is in Java enroute to Borobudur where the penny drops. 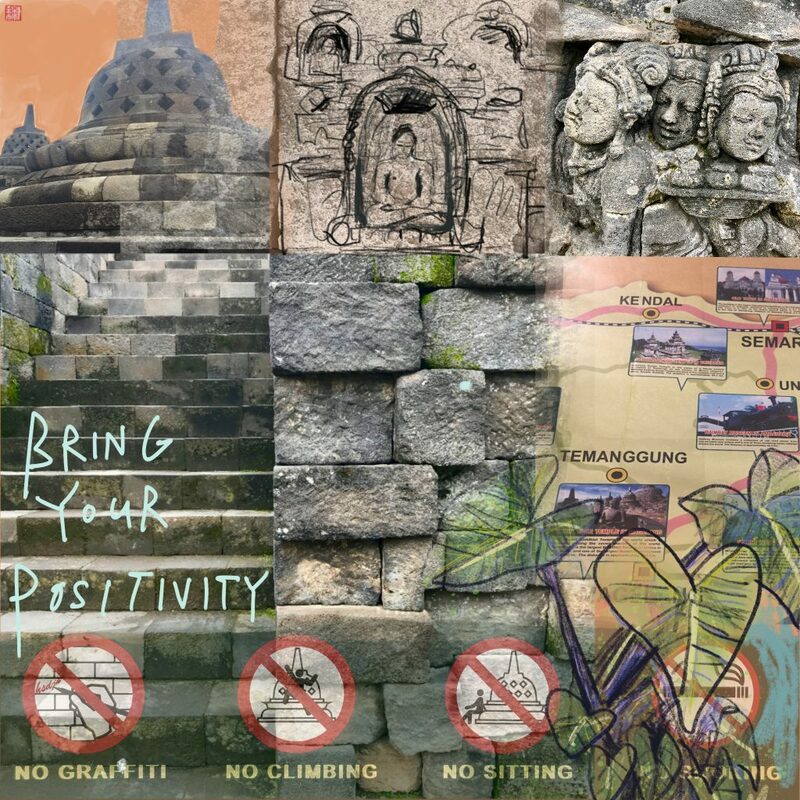 Trapped on a tour bus I bristle at my lost freedom until our guide nonchalantly reminds us that at Borobudur, “it’s best to bring your positivity. Open your heart and be your best for Buddha.” And the day shifts and I spend the next several hours climbing up and sketching down the different levels towards enlightenment at the top of the temple. I knew before I came onboard that Borobudur would be important. But little did I know that the words of a Muslim guide about how to behave at a temple would move me so deeply. Keep listening and keep positive is my mantra as this ship sails me home.